About a year ago we introduced something we had been working on for years, our online community lifecycle. The lifecycle was based upon Iriberri and Leroy's initial work and our own research and experience. It was the sum of everything we had learnt about communities until then. If there is one single thing every community manager should know about communities, the lifecycle is it. Using the lifecycle you can identify exactly where you are now and where you need to go next. In this post, we're going to explain the full online community lifecycle. If you take the time to read this post, it will completely change how you approach your community. You will be more informed about communities than most community professionals you meet. Better still, you will be able to explain to your organization exactly what you need to do next and why. This might not be a short, pithy, e-mail, but it's an incredibly valuable one. The lifecycle consists of four stages, 1) inception, 2) establishment, 3) maturity, and 4) mitosis. The names are less important than the activities that you need to perform at each stage. * The sense of community is a score derived from the results of surveys. The tasks you perform in the inception stage of the online community lifecycle will be significantly different from those you undertake in the maturity phase. You shouldn’t be doing the same job from one year to the next. Your role evolves with the community. Let's cover each of these stages in a little more depth. The inception stage begins when you begin interacting with the target audience and ends with the community achieving a critical mass of growth and activity. Critical mass is a term from nuclear physics defined as the minimum amount of fissile material to sustain a nuclear chain reaction. This term has become co-opted by social scientists as a tipping point used to describe when any social activity becomes self-sustaining. For community purposes, the critical mass is the point at which the level of growth and activity in the community begins to take off without your direct involvement. This point is numerically defined as when more than 50% of growth and activity is generated by the community (as opposed to the community manager). The sole goal of the inception stage is to achieve critical mass. To achieve critical mass you need to cultivate a small group of highly active members in the community. This group becomes the foundations upon which to build the community. Every big community begins as a small community. Unless a small, active, group is established it is impossible to develop a successful long-term community. We wrote an entire (free) ebook on this topic; The Proven Path. During this phase of the online community lifecycle, you should focus upon micro-level activities designed to solicit a high level of engagement from a relatively small number of individuals. It is important to establish momentum, a sense of possibility, and a regular amount of activity from members at this stage of the lifecycle. You should be individually inviting people you have developed relationships with to join and participate in the community. These relationships should have been developed before you launch the community. These invitations will usually take place by e-mail, although personal invitations at events and in other channels are also acceptable. Directly inviting people you know is the most reliable source of early growth in online communities. You will also stimulate activity in the community. First, you will be initiating discussions on topics that research has shown members are interested in. These can be scheduled in advance and mix those which are designed to convey information with those that affect members on a psychological level, such as bonding/status-jockeying discussions. Second, you should be prompting members to participate in these discussions. This requires individually reaching out to members through the site or by e-mail and letting them know that their opinion on the discussion would be valued. The purpose of this is to get these members into the habit of regularly visiting the community to see the responses to their own efforts. It takes time for visiting a community to become a habit. Until the community becomes a habit, members need frequent reminders to participate. Automated reminders are not enough. At this stage you should also invest time in building good relationships with members. This requires individually reaching out to members and identifying ways to be of assistance or continuing to learn what members are most interested in. This ensures a steady flow of activity, feedback on current activities, and opportunities to initiate activities in the future. As the community begins to develop, members will begin to invite others in their online and offline social networks to join the community. A gradually increasing number of new members will arrive without you inviting them. In addition, members will begin initiating their own discussions in the community. This number should steadily increase. Members will also begin replying to discussions without you directly promoting them. This shows that the community is beginning to become a habit. 1) Inviting members to join the community. 2) Initiating discussions members will be interested in. 3) Prompting members to participate in discussions. 4) Building relationships with members. This phase can last anywhere from 0 to 9 months. Any longer typically indicates a development problem. It shows the community is not naturally taking off and there is either a conceptual problem, or a tactical problem. If community members do not begin inviting others to join, nor initiating activity without you directly prompting them, this is a sign that either the community concept is wrong (the community isn’t about a topic members are interested in, see chapter TK), or you’re using the wrong tactics. This may be due to errors in your approach or not testing the different possible approaches. In the latter example, the way you interact with members, inviting people to join, or initiates discussions is wrong. Approaches that are too long, for example, or discussions which are not relevant enough to members, are unlikely to generate a lot of activity. In addition, in some sectors approaches that are too formal or feel pushy also fail to solicit the desired activity. The establishment phase of the online community lifecycle begins when the community has reached critical mass. This is the point at which the community generates more than 50% of growth and activity. As the community develops, the level of responses to posts increase and members generate an increasing level of growth and activity. 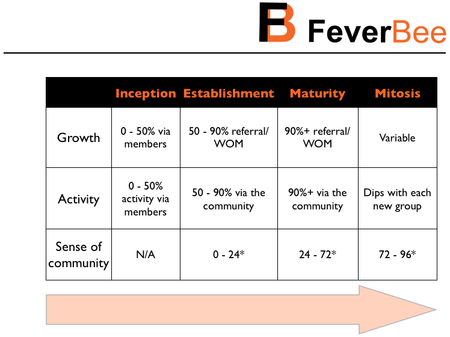 The establishment phase ends when members are generating over 90% of growth and activity in the community. There also needs to be a limited sense of community to advance to the maturity phase of the community lifecycle. Once the establishment phase has been reached, your role gradually shifts from the micro-level tasks that focus on individual members at a time to more macro-level activities (tasks that affect several members at a time). These activities will include those that sustain growth, activity, and develop a sense of community. The objective of this phase is to continue increasing growth, and activity, develop a limited sense of community and provide the basis for sustainable development of the community. This final point is important. It would be difficult, for example, for anyone to handle a community membership numbering over 100,000 active members without support. The processes that allow a community to scale must begin relatively early in the community’s lifecycle. You should now gradually shift away from direct growth and encourage referral and promotional growth (members inviting their friends and coverage in media outlets read by the target audience). Referral growth tactics will include ownership/involvement level ideas that encourage members to invite their friends. For example, you establish an event/goal that members participate in, increase a sense of ownership and thus invite other people in their social network to join the community. Or you might focus upon sharing content/discussions within the community. You will also spend more time converting newcomers into regular members of the community. There will also be some promotional activities undertaken during this time. This might be outreach to bloggers/magazines, issuing statements on behalf of the community, hosting events that attract interests of your target audience. Don’t leave growth to chance, you have to proactively stimulate it. As the community begins to grow, it will be important to embed scaling processes. Most organizations allow their communities to grow until they become unmanageable. Don’t let this happen to you. Embed scaling processes early in the development lifecycle. Prepare to have a big community now. This will involve recruiting volunteers, developing the platform, and optimizing areas of the site. The community manager will also have to spend more time on moderation. This will involve resolving disputes between members, concentrating and dissipating activity (we will explain this later), removing spam/inappropriate material, highlighting the most popular discussions/activities. At this stage of the lifecycle, you must begin to introduce elements which increase the sense of community felt amongst members. This will usually involve initiating events and activities as shared experiences, introducing a community constitution, securing the community promotion in other media, and documenting the community history. You need members to feel they are part of a community together. This sustains a high level of activity amongst members. In essence, it keeps people returning to the community to see what’s new, as opposed to only visiting when notified of a reaction to their own post. During this phase of the lifecycle, the community should see growing levels of growth and activity. These should be closely correlated. Growth should increasingly come from referrals/word-of-mouth activity. This may not be easy to measure, but can be ascertained by asking newcomers how they heard about the community. In addition, the community should continue to generate an increasing amount of its own activity. The level of responses per discussion should continue to rise and the number of discussions initiated by members should also steadily increase. A community in the establishment phase should show continued growth and development, in addition to a sense of community. This is often reflected in a growing amount of off-topic/social chatter. There should also be signs that a sense of community is developing amongst members. This may include in-jokes, a continuation of discussions beyond the immediate subject matter, an increasingly level of direct contact between members, higher levels of self-disclosure in debates and other signals of familiarity between members. A drop in growth or activity indicates a potential problem for the community. If growth increases but the activity drops, then members are becoming less active than before or a smaller number of members are accounting for an increasingly larger share of activity. Tracking relevant data is important to spot these potential issues. Once this issue has been identified you can initiate activities designed to change this trend before too many members are lost. Once you enter a dip, it’s hard to avoid a death spiral (less activity begets less activity). It is also common for community managers to switch roles too early. This means to go from micro to macro-level activities too rapidly as opposed to gradually shifting roles as the measurement of growth and activity shows progress. The maturity phase of the online community lifecycle begins when members of the community are generating 90% or more of activity/growth, and there is a limited sense of community. This is measured through growth, activity, and sense of community metrics. The maturity phase ends when the community has a highly developed sense of community, but the level of activity or sense of community amongst members has plateaued. Most of the familiar online communities are in the maturity phase of the online community lifecycle. They are established, highly active, and have a highly developed sense of community. They also merit a lot of attention within their ecosystem. This final element, external attention, is common amongst mature communities. They become the definitive place for those interested in that topic. Mumsnet is the definitive community for parents in the UK. Techcrunch is the definitive community for the start-up companies. 4Chan has a thriving online community for online hackers/pranksters. By this stage, you should only rarely be initiating discussions, prompting people to participate, or engaging in any micro-tasks besides those that facilitate relationships with members/volunteers. You should only do this to fill in the gaps (i.e. when there is a lull in activity, it makes sense for you to prompt a few discussions). Now you should be focused solely upon macro-level activities that have the biggest long-term impact upon the majority of members in the community. This includes scaling processes, events/activities, content, optimizing of the platform, developing a strong sense of community, increasing the profile of the community outside of the platform. Your volunteers or additional staff should now be handling the micro-activities undertaken in the previous stages of the lifecycle (e.g. conflict resolution, removing spam, responding to member queries). You need to focus on the bigger things. o can be interested in the community’s topic. Once this figure has been reached, further growth is not possible. In addition, there will eventually be a plateau in activity. This occurs when members are as active as they can possibly be. This is the outcome of members that have a strong sense of community and dedicating as much time to the topic as they possibly can. The goal at this stage is to sustain this high level of activity and increase the sense of community amongst members. A plateau is not a major cause for concern. It is the natural and final evolution of a successful online community. You should only be concerned when there is a decline, especially a sustained decline. We cover this topic in the mitosis phase of the community lifecycle. During this phase, all growth will come from referrals/word-of-mouth activity (such as sharing content/discussions, networking at events, or generally being a well known community within the sector), and potentially major promotional activity undertaken by the organization. The community manager helps facilitate the latter gaining publicity in major outlets and by developing a system by which all members feel a sense of ownership over areas of the community. This will involve ensuring the community is frequently mentioned with regards to its sector and also making the community have influence within its realm. For example, by releasing regular statements related to relevant issues within the sector, working with influencers to implement desirable change within the sector. Mumsnet, for example, frequently campaigns on behalf of its members. Mumsnet proactively runs campaigns on issues its members care deeply about. The success rate is remarkably high. 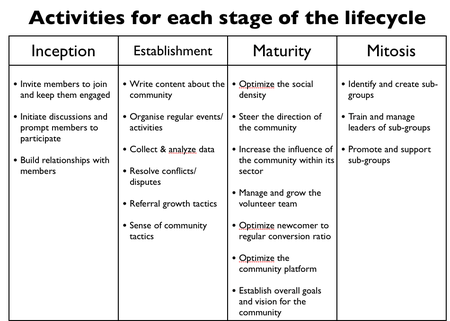 The level of activity per member will peak during the maturity phase of the community lifecycle. The community will become highly responsive and you should focus upon optimizing activity. This will involve reviewing what areas of the site are used and optimizing the most used features. This will also include closely analysing the process through which a newcomer becomes a regular and taking steps to optimize that process. This is a data-driven process, not a haphazard series of actions. The activities undertaken at this stage blur the lines between growth, activity, and sense of community. Releasing statements on behalf of the community, for example, achieves all three. It promotes the community, it increases activity from members talking about the issue, and makes members feel a greater sense of community from the influence their community has upon its ecosystem. The objective at this stage is, counter-intuitively, to hit the plateau. The goal is to reach the point where the community has reached its initial maximum potential. Everyone in the sector should know it, your members are highly active within the community, and there is a deep sense of community amongst members. The mitosis phase of the online community lifecycle begins when the community is almost entirely self-sustaining and continues indefinitely (with a view to the community reforming around greater focused sub-groups). Not all communities progress to this phase. For example, my friend Susan runs Park Slope Parents, a community for a few thousand parents in the Park Slope area of Brooklyn, New York. Her community is highly active, but will never grow so big it needs to split into multiple sub-groups. It has a much smaller potential audience than a larger community like Mumsnet. Susan has seen this community through to the maturity phase of the lifecycle. She’s maximized the potential of that community. Therefore, it won't enter the mitosis stage of the lifecycle. If your prospective target audience is bigger than this, the mitosis phase of the lifecycle is more important. Not all communities advance to mitosis. The message history for Park Slope parents shows a plateau since 2007 without any significant decline. If you have a large potential audience (or a large existing community), when the plateau has been reached you need to shift your role against from optimizing to facilitating multiple, smaller, online communities. The objective of this phase is to sustain and increase the level of both activity, and sense of community. During this phase of the lifecycle, the growth to the community as a whole should remain consistent, but the growth to the smaller sub-groups should be growing as per the inception stage. This means, initially, the co-founders of the sub-group will invite new members; these will usually be through existing contacts made in the community. You may also have to stimulate this growth by mentioning new groups through content/discussions, and by hosting events and activities for these groups. Each of these sub-groups should endeavour to achieve a critical mass within the first three months of existence. You will need to train people to manage these groups and provide support when necessary. The overall level of activity to the community should increase as members reform around stronger common interests (social circles, niche interests within the topic). Each group should be smaller, but more members will have the opportunity to be involved. In the short-term, there may be a brief dip in activity as members gradually move from the broad topic into a niche group based around their activities. You need to focus on identifying the potential sub-groups at this stage. This means identifying the topics or interests which have continually arisen within the community, then creating a group specifically for these individuals. This group might be a forum category or any other place within the community platform where people can interact. In ScienceForums, members each have several sub-groups they participate in. The broad topic ‘science’ has been artfully broken into highly active sub-groups. Alternatively, you may identify social groups that have developed within the community and build areas within the platform just for close groups of friends. These groups might be elders, newcomers, those that have attended particular events (events especially are a good place for members to bond). You might want to look at your original audience overview here to identify clusters of people that share the same demographic, habitual, or psychographics traits. These are ideal categories for developing sub-groups. The sense of community at this stage will dip before rising considerably. Past a certain stage, it’s impossible for all members to feel a sense of connection with everyone. Breaking the community into smaller sub-groups helps sustain these connections. Fewer people are more active in the community. a single time, but to gradually increase the number of groups in the community. During this phase of the community lifecycle, the community manager balances the role of sustaining a healthy community in the maturity phase with developing self-sustaining groups. Note with the tasks below, as per the previous phases, there is a gradual shift from the maturity level tasks to the mitosis level tasks. This should not be an abrupt change. It may be possible not to split the entire community into sub-groups, just elements/people within the community. Whilst the number of mitosis task feels light, it is a highly repetitive process. This means, for instance, the amount of managing of sub-group leaders will steadily increase throughout the lifespan of the community (perhaps until you’re managing the people that manage the sub-group leaders). As the community advances into the mitosis phase of the community lifecycle, an increasing number of successful niche groups/topics should begin to be visible within the community. These should be independently run with only small assistance from you. Over time, these sub-groups should be organizing regular events, maintaining a regular content schedule, and become relatively self-sustaining, close-knit, entities within the community. As I mentioned earlier, it is common for community managers to let their community become too big and too active without proper structure. Beyond a certain level of active and a certain number of members it becomes difficult for all members to believe they can influence the community. Past a certain number of active members in a community, it becomes impossible for a high level of familiarity to persist. Members will know fewer and fewer of the participating members. Therefore, the overall sense of community in the community begins to decrease. This often leads to less ownership over the community and eventually a lower number of participating members. This is similar for the level of activity in a community. Once a community becomes too active, it becomes difficult for members to stay abreast of what’s new and what’s popular in the community. It becomes difficult to follow the overall narrative of the community. This is often referred to as ‘information overload’. A member that is used to catching up on 10 missed messages feels less motivation to catch up on 50, or 500 messages. It becomes harder to find the messages that will be of most relevant to that individual. If you fail to use your data to recognise these situations, it can result in the number of members gradually declining to a small group who retain a limited sense of community with one another. Another potential danger at this stage is top-down community planning. Instead of reacting to interests which have risen naturally within the community, those that have clearly gained a high level of participation, the community attempts a top-down approach to try and facilitate multiple groups at once. This approach his not suited to community development. First, creating multiple groups rapidly dissipates activity within the community. This can cause a sharp, uncontrolled, drop in the level of activity. Second, it can fail to develop any group to critical mass. Sub-groups need to be nurtured to advance past the inception stage. It’s important to develop these individually before making a huge change at this stage. If you've read this far, you now know how to measure the progress of a community and use those measurements to identify what you should be doing in your community. Your goal, and the goal of every community manager, is to progress their community through the lifecycle. If you achieve this, you maximise what your community can be, the benefit it brings to your organization, and the benefits that members gain from the community. If you're serious about your work, and your company is serious about it's community efforts, this course will really help. You've taken the first step to fully understanding how communities work, if you want to learn the rest you can sign up for FeverBee's Professional Community Management course.